The most extensive Japanese language resource for high school and university students available. Britannica Online Japan is an essential resource for conducting thorough research for both native Japanese speakers and students learning Japanese. This venerable database includes selected articles from the Japan Book of the Year, from distinguished Japanese scholars, subject specialists, and Nobel laureates in addition to translations of English articles by renowned experts. Leverage “Britannica Highlights”; original articles written by distinguished scholars, experts, and Nobel laureates from around the globe. 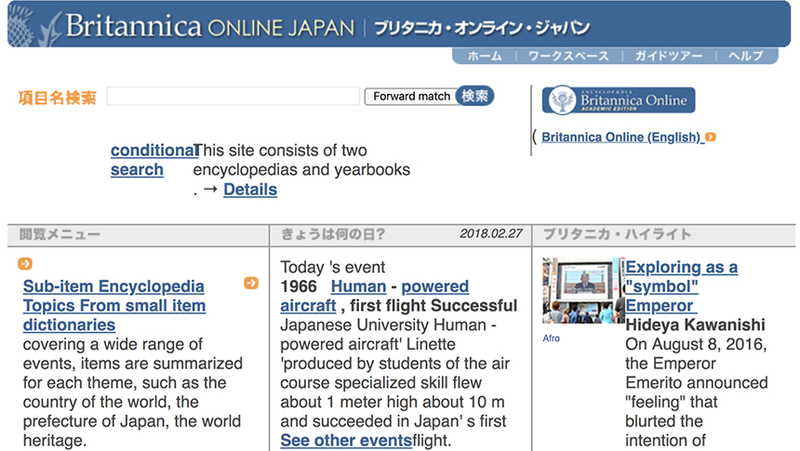 Learn more about Britannica Online Japan! Check population, life expectancy, industrial output, household income, labor force, education and other key stats etc. Tap into our country comparison and automatic timeline generation tool. Dive in with the "On This Day" feature. Discover more with “On This Day” search features for important events.